Buffer shares your content at the best possible times throughout the day so that your followers and fans see your updates more often. Get the most out of each post. As you add content, you can easily select which of your social accounts you want to post to. Post the same message to all accounts or add context by customizing each. An image tells more than a thousand tweets. Make your updates stand out! Upload your video to Buffer. Create beautiful images in seconds. Share them to all of your social platforms! Whether you are browsing the web or on the go, you can easily add content to your queue with our browser extensions and mobile apps. Save time and get more done by working from anywhere. Create images with the perfect size and format for Twitter, Facebook, Instagram, and even Pinterest. Typography, font sizes and formatting options make everyone a designer! 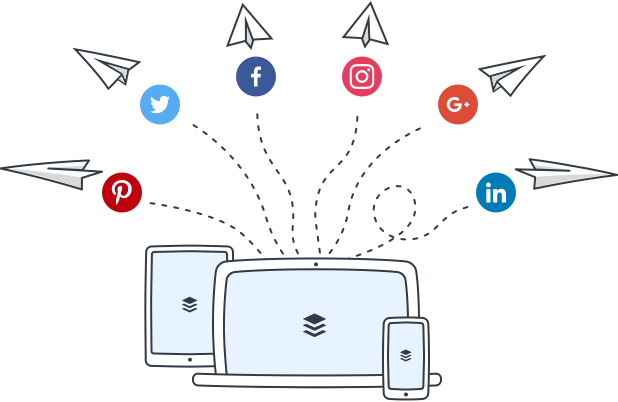 Buffer allows your marketing team to share content at the best possible times throughout the day in order to drive more traffic and increase fan engagement. Get the most out of your content. Streamline your social media management by efficiently coordinating with your team. Allow multiple people to contribute while easily managing permissions and moderating contributions. Easily visualize the impact of your social media marketing with our rich analytics. Track engagement, conversions, and trends in order to prioritize your efforts.